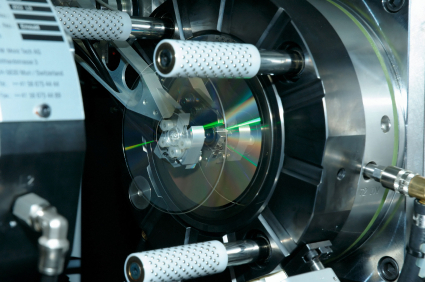 CD Manufacturing is the process of transferring data from one CD disc (master disk) to a number of others. Manufacturing of CD-ROM (replication, duplication, stamping, printing, method of casting - synonyms of this word-combination) the most time-consuming and lengthy stage. The process of manufacturing of CD discs is as follows: pre-manufactured glass master is installed in the press-form thermoplastic-automatic machine. The molten zinc is supplied under high pressure into the mold and, getting on the matrix fills the void, acquiring a superficial relief, mirror relief of the surface of the matrix, after which, within a few seconds, he cools down. As a result, the pipeline is fed transparent disk that contains information in the form of pits, received in the process of casting. In order to further the laser playback device was able to find the information (the order of the location and length of the pits) from the disk, on his method of electroforming spraying is applied a thin layer of high pure aluminum (sometimes use special colour alloy, in this case, the disk becomes the so-called "Golden" color). But CD manufacturing not end there, for the protection of aluminium oxidation and mechanical influences disk from the top is covered with a thin layer of UV - varnish. After this CD comes to the station testing, where is determined by its quality, and the defective disks it in a special buffer only after this disc replication is completed.